Alexandria has powered up their revenue-generating red-light cameras along Route 1, as well as on Duke Street in an attempt to make us all “safer”. While this is probably less expensive than parking a police officer on the corner with a ticket pad, that certainly seems like something that would chasten people for running the light rather than just treating it as an “expensable” behavior like going over your cellphone minutes. Grow a brain. Running red lights is not a civil liberty. Its illegal because it puts pedestrians, other drivers, their passengers and you at risk. Fines and cameras work. Who said anything about civil liberties? 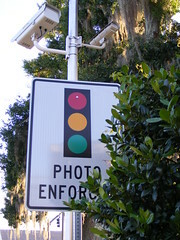 Cameras are only effective at 2 things: causing accidents and enticing municipalities to illegally shorten yellow lights in hopes of increasing ticket revenue. I agree that red light running is a pretty appalling display of disregard for other human beings, but cameras just shift the problem elsewhere. If by “shifting the problem elsewhere” you mean it penalizes people who view penalties for running red lights oppressive then you are correct. Stupid government and its constant attempts to make us “safer.” This injustice must not stand. Cameras don’t actually correct the bad behavior, they just cost you money. Yes of course, who worries about paying money or getting a ticket when they see a stoplight turn yellow? Fines are a joke. Just ask all those jackals who speed down the HOV lanes alone every day before double parking in a fire zone. Much better to leave enforcement of this to police officers who can hand out tickets to those lucky enough to get caught when they have plenty of more serious work to do. That will surely be more effective than cameras that catch every single person who runs a light 24 hours a day, 365 days a year. Honestly, why are the fines $50 if they actually want to make them hurt? Seriously, redlight camera fines are significantly less than their ticketed equivalent, and most of the fine goes to the camera company anyhow. How does this make us safer, again? Cameras make you safer by reducing the number of injuries in crashes at stoplights. RTM or spillover, affecting their accuracy. Larger and better controlled studies are needed.